Severe weather expected in the region again this afternoon and evening. 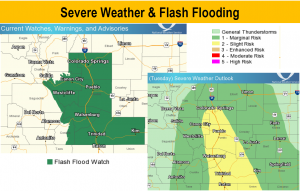 The National Weather Service predicts another severe thunderstorm today with large hail, high winds and potential flash flooding. Greatest risk across the southeast mountain range and I25 corridor. Use caution traveling in the region. This entry was posted in Uncategorized on August 7, 2018 by ssmith3.